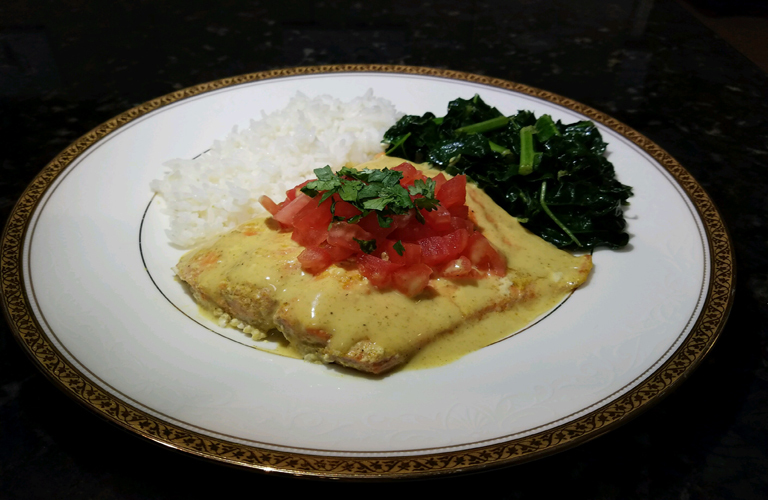 Enjoy salmon with a coconut/curry twist! A simple meal that adds character and rich flavor to this heart/brain healthy fish. Preheat oven to 350 F. Mix coconut milk with arrowroot or cornstarch and curry powder in a 2-3 quart ovenproof dish. Add salmon and bake covered for approx. 35-45min (or less, depending on how you like your salmon and varying oven temperatures). Add salt and pepper to taste. Serve immediately with some of the sauce on top of each fillet and top with the tomato and basil or cilantro. Remaining sauce may be used to top rice (as shown), or veggies such as cauliflower, broccoli or green beans.